The Model 6221 is the only AC current source on the market. Until now, researchers and engineers have been forced to build their own AC current sources. The Model 6221 provides better accuracy, consistency, reliability, robustness, and cost effectiveness than "home-made" solutions. It is also the only commercially available current source waveform generator, which greatly simplifies creating and outputting complex waveforms. Pulse widths as short as five microseconds can be programmed, and the instrument supports pulsed I-V measurements. The model 6221 Current Source combines ease of use with exceptionally low current noise. Low current sourcing is critical to applications in test environments ranging from R&D to production, especially in the semiconductor, nanotechnology, and superconductor sectors. High sourcing accuracy and built-in control functions make the model 6221 ideal for applications such as Hall measurements, resistance measurements using delta mode, pulsed measurements, and differential conductance measurements (an increasingly common measurement for characterizing semiconductor and nanotechnology materials). Both current sources are fully programmable via the front panel controls or from an external controller via RS-232 or GPIB interfaces; the Model 6221 also features an Ethernet interface for remote control from anywhere there's an Ethernet connection. Both instruments can source DC currents from 100fA to 100mA; the Model 6221 can also source AC currents from 1pA to 100mA. The model 6221 offers tools for defining current ramps and stepping through predefined sequences of up to 64,000 output values using a trigger or a timer. Both sources support linear, logarithmic, and custom sweeps. The Model 6221's combination of high source resolution and megahertz update rates makes it capable of producing high fidelity current signals that are indistinguishable from analog current ramps. Device testing and characterization for today's very small and power-efficient electronics requires sourcing low current levels with great precision. Lower stimulus currents produce lower--and harder to measure--voltages across the device. Combining the Model 6221 with a Keithley Model 2182A Nanovoltmeter makes it possible to address both of these challenges. When used with the Keithley Model 2182A Nanovoltmeter, the Model 6221 measures resistances from 10nohm to 1Gohm. Used in this way, the Model 6221 acts as a high performance alternative to AC resistance bridges and lock-in amplifiers for measuring resistances and coordinates pulsing and measurement with pulse widths as short as 50 microseconds. The combination measures differential conductance up to 10X faster and with lower noise than earlier solutions allow and can be used in delta mode, which improves resistance measurements up to 1000 times. Included control software simplifies setup and operation. The model 6221 sources 100fA to 100mA with 100fA resolution on the lowest DC current range and feature current noise as low as 80fA RMS. A reconfigurable triax output simplifies matching the application's guarding requirements. Instrument control software is available for both Macintosh and PC computers. The Model 6221 sources AC currents from 1pA to 100mA, with 10MHz output update rate. 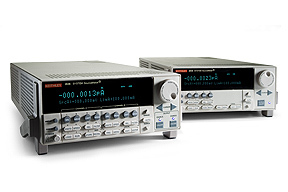 The unit features built-in standard and arbitrary waveform generators with 1mHz to 100kHz frequency range. The instrument also features an emulation mode for Keithley's earlier Model 220, which makes it easy to use a Model 6221 in an existing application without rewriting any control code.